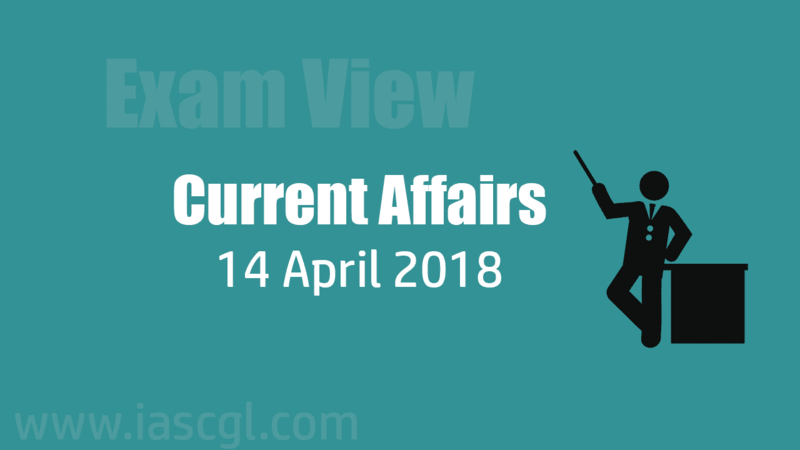 Current Affair of 14 April 2018, Exam View. The Union Home Minister Shri Rajnath Singh launched the web-based application 'e-FRRO' (e-Foreigners Regional Registration Office). Some of the salient features of the e-FRRO include online FRRO Service delivery mechanism without requirement of visiting FRRO/FRO Office barring exceptional cases. Prime Minister paid tributes to Mahatma Phule on his birth anniversary recently. Phule was India’s first Dalit reformer who offered a systematic theory of caste. In the 19th century, Jyotiba Phule was the most radical opponent of untouchability and the caste system as he called for the complete demolition of its oppressive structure. The Maharashtrian reformer and his wife Savitrirao Phule opened the first-ever school for Dalit girls in 1848 in Pune. Gulamgiri (slavery) is one of the 16 books written by him which was dedicated to the African-American movement to end slavery. Phule led the foundation of Satyashodhak Samaj (‘Seekers of Truth’) in 1848 in a bid to attain equal social and economic benefits for the lower castes in Maharashtra. The World Health Organisation (WHO) and the United Nations Children’s Fund (UNICEF) recently issued a new 10-step guidance to increase support for breastfeeding in health facilities that provide maternity and newborn services, which provide the immediate health system platform to help mothers initiate breastfeeding within the first hour and breastfeed exclusively for six months. Breastfeeding all babies for the first 2 years would save the lives of more than 8,20,000 children under age 5 annually, noted a release issued by the WHO. Breastfeeding saves lives. Its benefits help keep babies healthy in their first days and last well into adulthood. With the latest medal, India remains in the 3rd spot in medals tally with a haul of 18 Gold, 11 Silver and 14 Bronze. In shooting, Sanjiv Rajpur and Chain Singh reached the 50-metre Rifle 3 Positions Final. Indian wrestler and Olympic medallist Sushil Kumar bagged his third straight Commonwealth Games gold medal after winning the men’s Freestyle 74 kg event. The 34-year-old wrestler won the final 10-0, having dominated all previous opponents with scorelines of 11-0, 10-0, and 4-0. Sushil has a silver and a bronze in Olympics and was crowned world champion in 2010. Rahul Aware bagged India’s first wrestling gold medal at the Commonwealth Games 2018. Fifteen-year-old shooter Anish Bhanwala became India’s youngest gold medalist at the Commonwealth Games, winning the men’s 25m Rapid Fire Pistol Finals with a record score at Gold Coast. Earth’s magnetic field protects us from solar winds and other things that could pose a catastrophe. 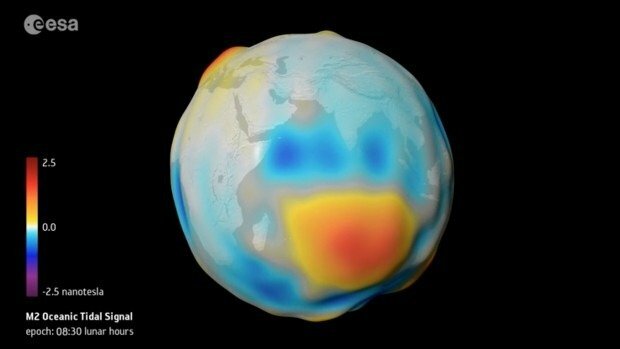 Recently, scientists managed to identify Earth’s second magnetic field which is being generated by Earth’s oceans and is also impacted by the moon. Scientists behind this discovery presented their work at the 2018 European Geosciences Union in Vienna, Austria. According to the scientists, the second magnetic field is created when Earth’s natural satellite, the Moon, affects oceans by pulling them through the magnetic field. This results in an electric current which leads to a magnetic field. Given that the recently discovered magnetic field is 20,000 times weaker than the main one, it is particularly challenging to detect or study. Jallianwala Bagh Massacre: What Happened On April 13, 1919 In Amritsar? The Jallianwala Bagh massacre, also known as the Amritsar massacre, took place on April 13, 1919. This is remembered as one of the deadliest attacks in the history of the world and is also a turning point in India's freedom struggle. At the Jallianwala Bagh, which is garden spread across 6 to 7 acres, a large gathering of 15,000-20,000 people with a majority of Sikhs, took place to celebrate the Punjabi harvest festival of Baisakhi. They had also gathered to revolt against the repressive Rowlatt Act that provided for stricter control of the press, arrests without warrant and indefinite detention without trial. But little did they know what the British India Army had in mind. On this day, around 50 troops of the British Indian Army, under the command of Colonel Reginald Dyer, fired rifles into a crowd of Baishakhi pilgrims, who had gathered in Jallianwala Bagh, Amritsar, Punjab. On Colonel Dyer's orders, his troops indiscriminately fired on the group of gathered civilians for about 10 minutes. Prime Minister Narendra Modi inaugurated the Dr. Ambedkar National Memorial at Mahaparinirvana, 26 Amirpur Road, Delhi, by Dr. Bhim Rao Ambedkar. This memorial is dedicated to the life and contribution of Dr. Ambedkar, the Constitution creator of India. On March 21, 2016, the Prime Minister laid the foundation for it. Bharat Ratna Babasaheb Dr. Bhim Rao Ambedkar was born on April 14, 1891 in Mau, Madhya Pradesh. He was the first law minister of independent India. After resigning from the Union Cabinet on November 1, 1951, Dr. Ambedkar lived in the house of Maharaja of Sirohi in 26, Alipur Road, Delhi, where he breathed his last on December 6, 1956 and received Mahaparinirvana. In memory of Dr. Ambedkar, the former Prime Minister, Shri Atal Bihari Vajpayee had dedicated the Mahaparinirvan site to the nation on December 2, 2003. The followers of Baba Saheb consider that place holy, where they received Mahaparinirvana. Since this building has been built as a memorial of Constitution Maker Babasaheb, the building has been given the size of the book. This building has an exhibition venue, a memorial with Buddha statue, meditation center and Dr. Ambedkar's 12-foot bronze statue. At the entrance, the meditation center is built on the Ashoka pillar (11 meters) and the rear. Apart from this, a musical fountain; Chhatri (the statue of Dr. Ambedkar in Buddhist umbrella): Bodhi tree (planted in the outer part); The pylon gate (number 02) and A. V. Museum, a museum that has been engrossed with its media through static media, dynamic media and audio visual content and multimedia technology, and their contribution to the modern India. It has installed solar power plant (50 kW) on roof with sewage treatment plant (30 KLD), rain water irrigation system and net metering. The building has been erected in 7374 sq.m area and its total built area is 6758 square meters.